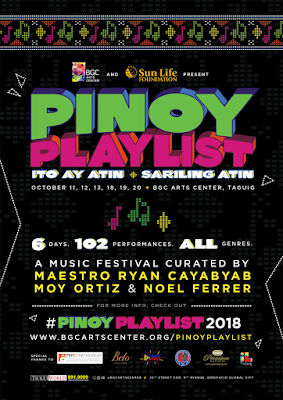 For 6 days in October this year, October 11, 12, 13, 18, 19 and 20, 2018, the BGC Arts Center will launch a landmark festival: "Pinoy Playlist 2018, Ito ay Atin, Sariling Atin". Made possible with the support of Sun Life Foundation, it will be the first of an annual Music Festival curated by Maestro Ryan Cayabyab, Moy Ortiz, and Noel Ferrer. The festival will gather great music being generated and appreciated in pockets of ages and places, collectively showcase them, and hopefully serve to inspire the collective rise of Filipino music. 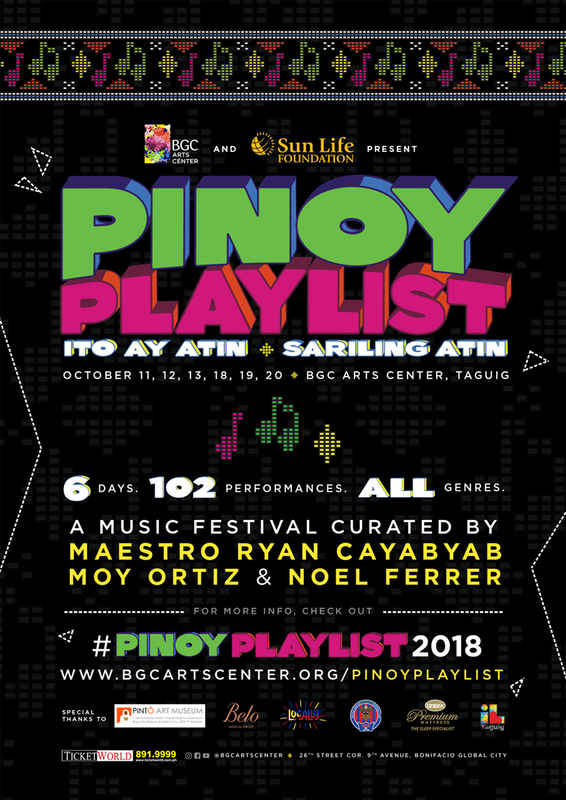 Pinoy Playlist will ​reinvigorate the tradition of Filipino music by exposing the breadth and range of Filipino musicality across time, from vocal groups, solo, bands, classic, indigenous, pop, and collaborations in between these forms of musicality, to celebrate the evolving nature of Filipino music. ​The matrix of Filipino music will shine in its variety and blaze with the talent of artists across generations.